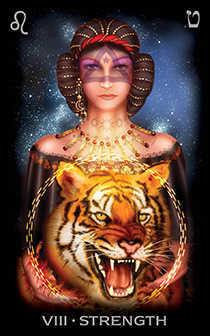 Balance your primal force with intuition and compassion. 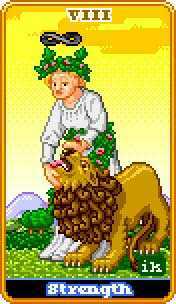 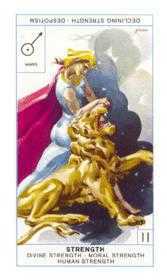 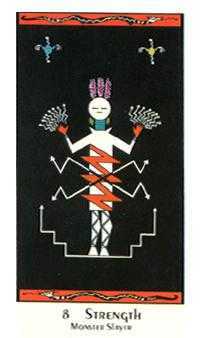 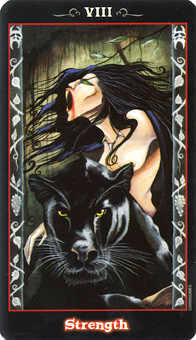 Morgan-Greer deck © U.S. Games Systems, Inc. 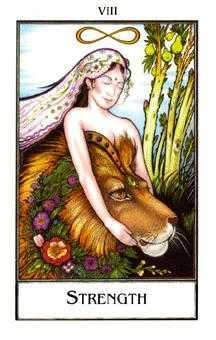 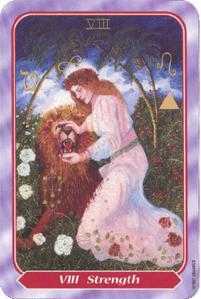 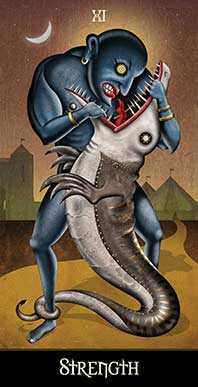 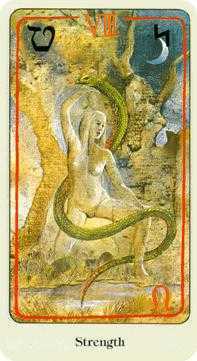 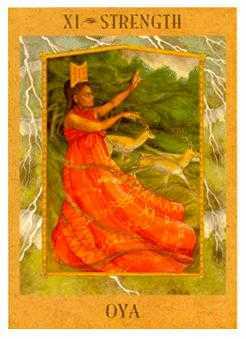 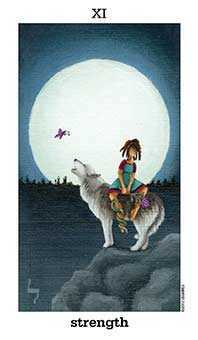 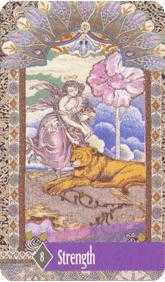 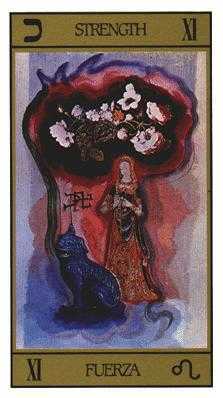 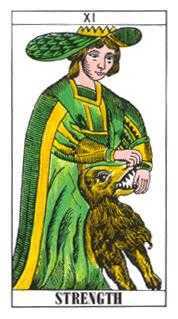 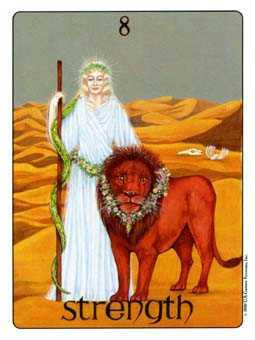 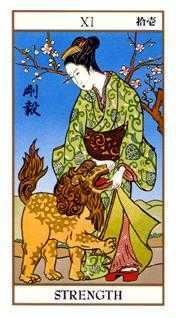 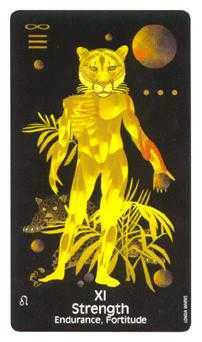 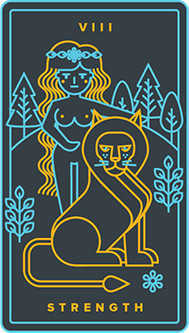 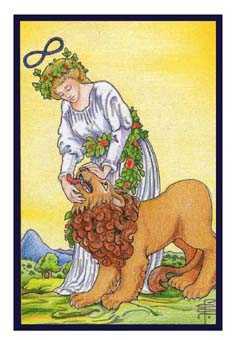 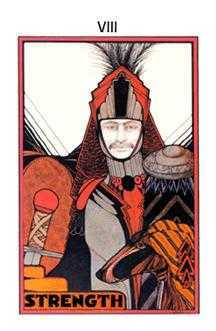 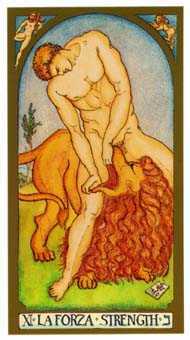 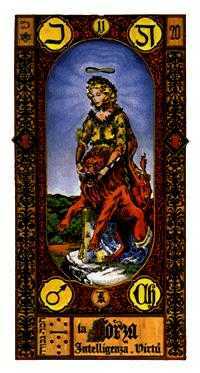 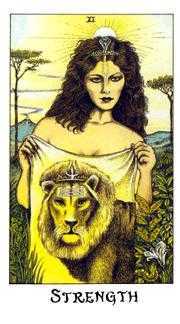 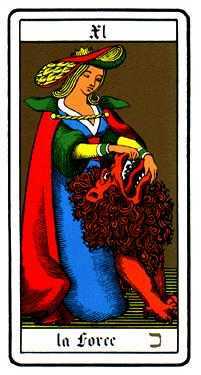 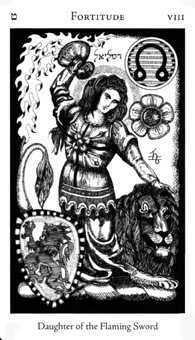 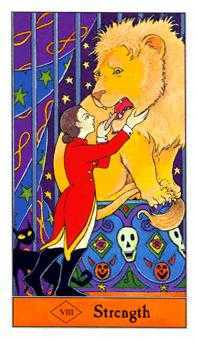 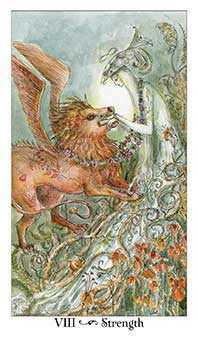 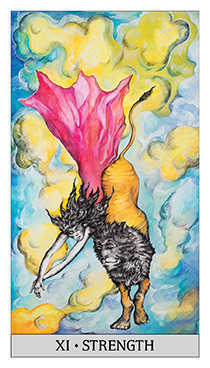 The Strength Tarot card represents nature, which, however wild in its primal form, is tamed by our subtler, finer self -- our feminine side, our inner self. 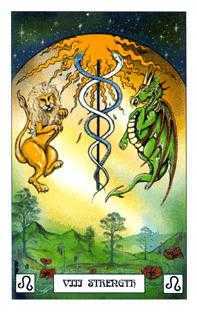 The will and passion of our instinctive nature does not need to be broken, but refined and brought to consciousness, so that all levels of creation may come into harmony. 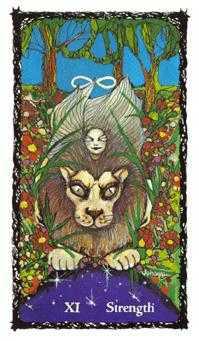 The feminine soul-force contains a persuasive power that can nurture and induce cooperation from others, stilling disruptive energies by harmonizing differences in the spirit of collective good will. 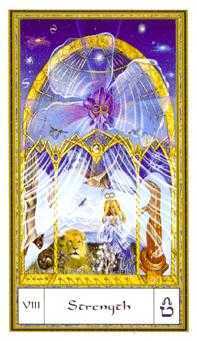 Clearly distinguish between your ego and your intuitive self. 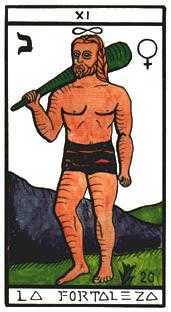 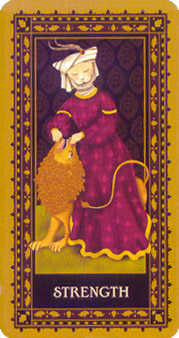 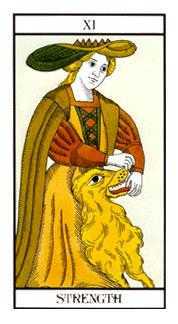 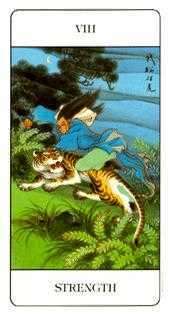 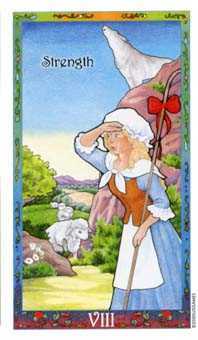 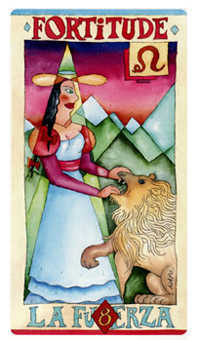 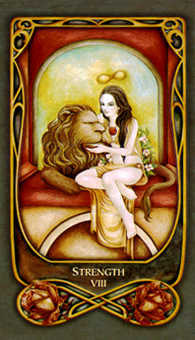 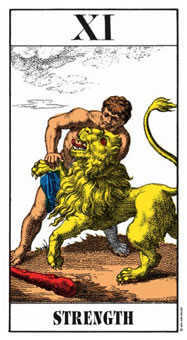 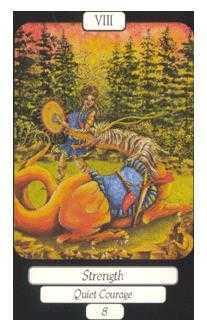 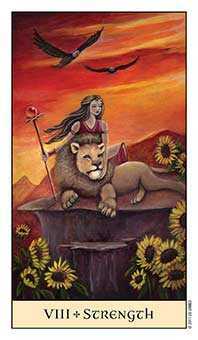 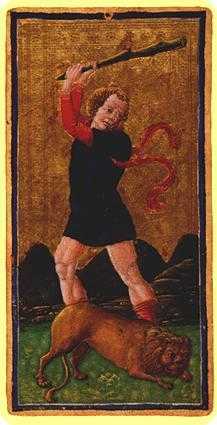 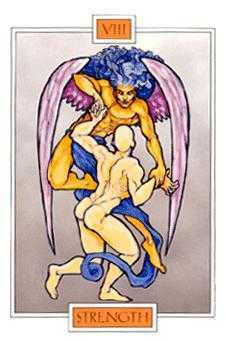 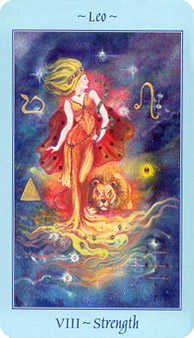 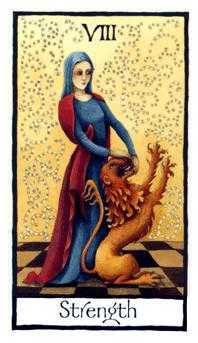 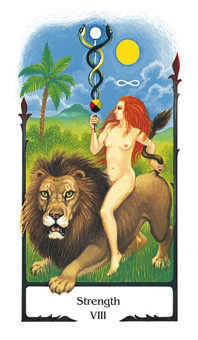 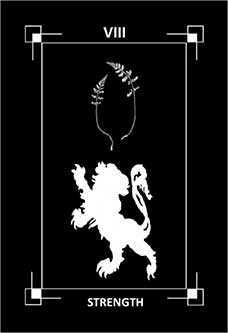 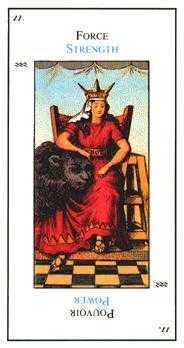 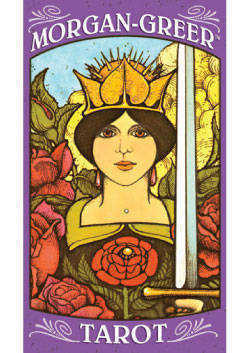 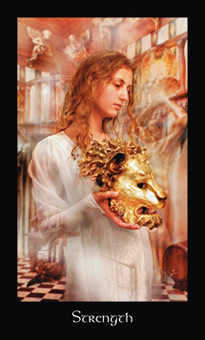 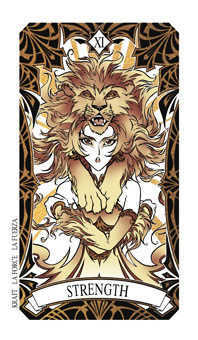 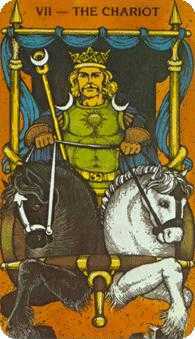 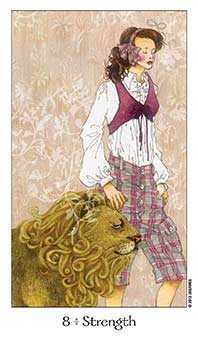 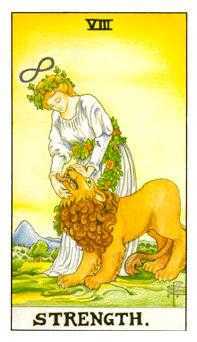 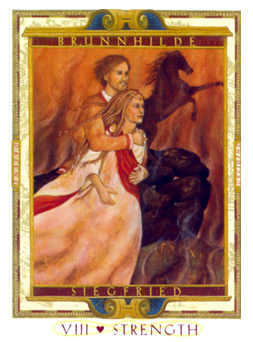 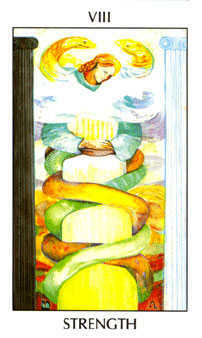 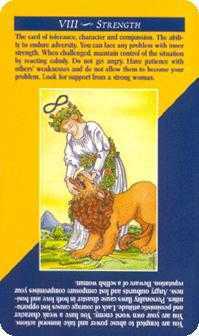 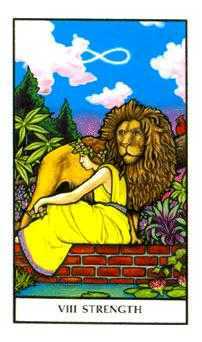 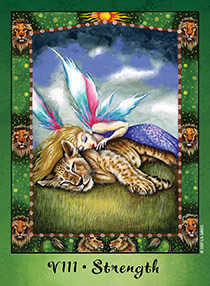 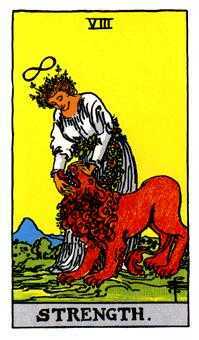 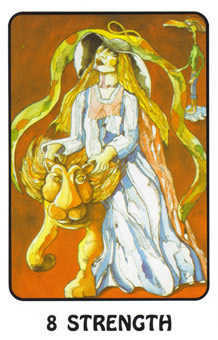 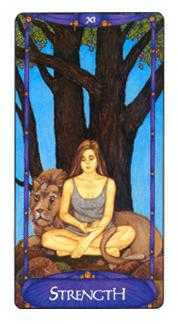 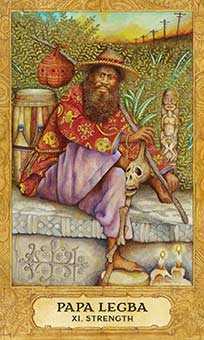 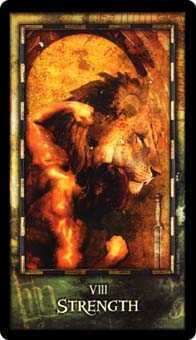 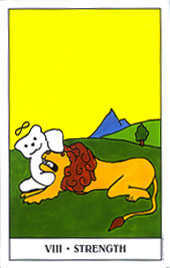 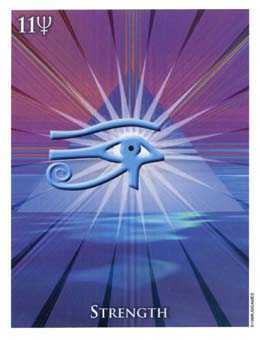 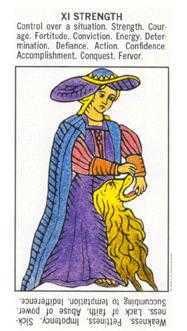 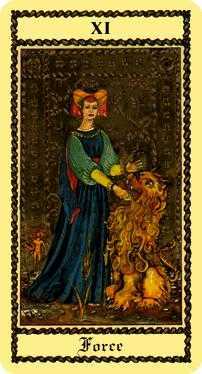 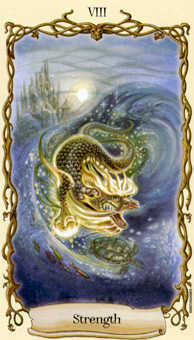 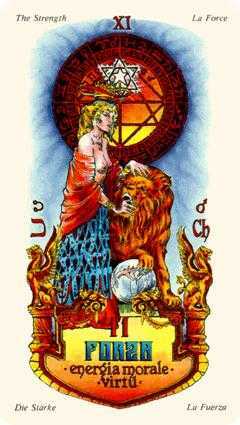 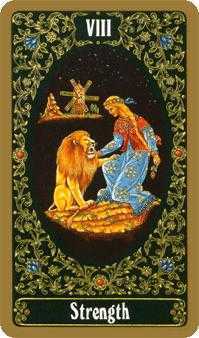 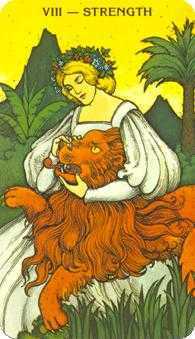 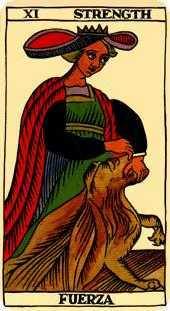 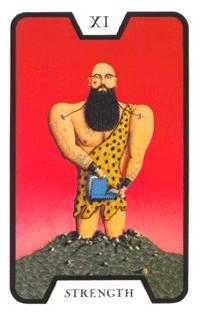 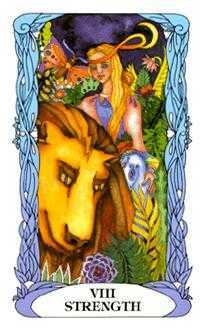 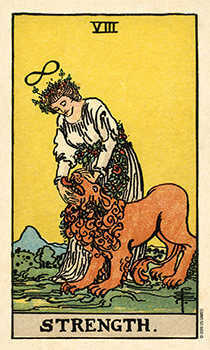 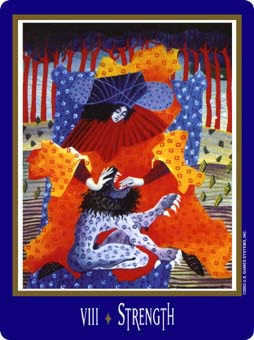 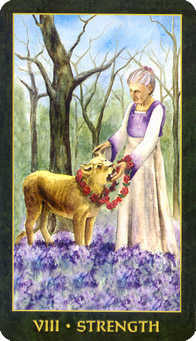 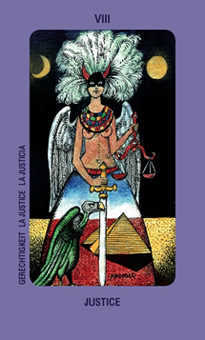 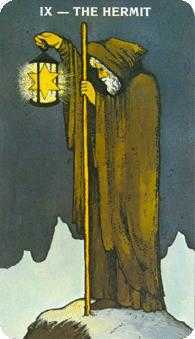 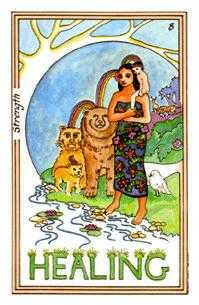 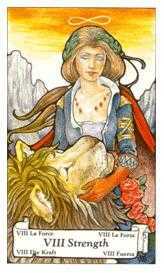 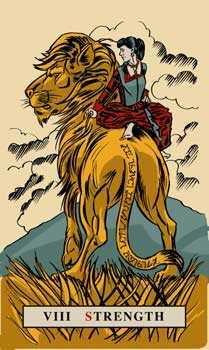 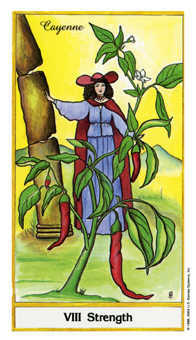 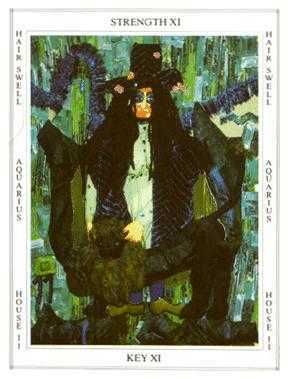 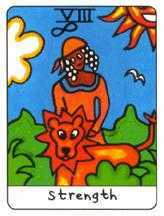 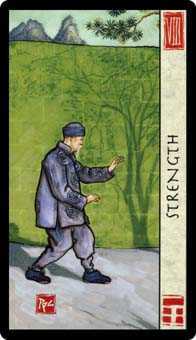 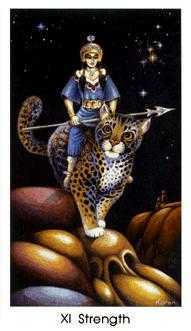 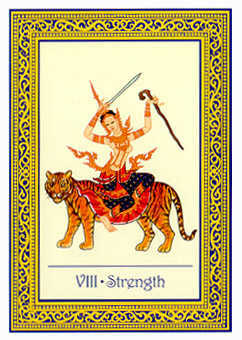 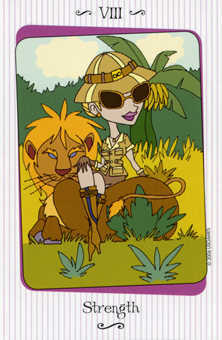 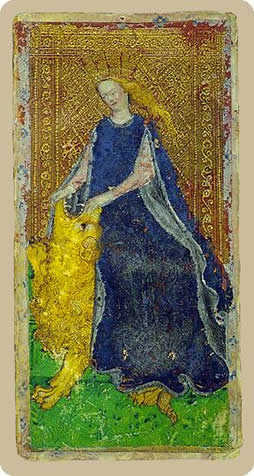 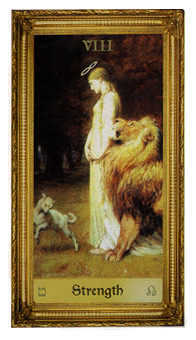 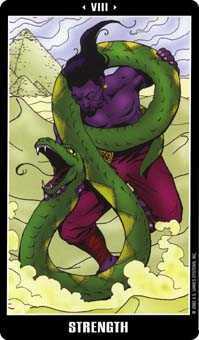 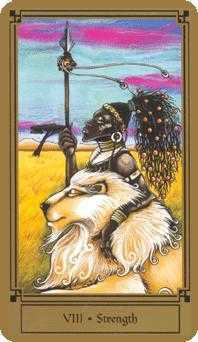 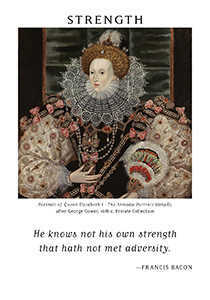 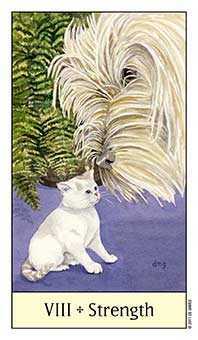 The Strength card advises that you assertively discipline yourself and separate self interest from enlightened wisdom. 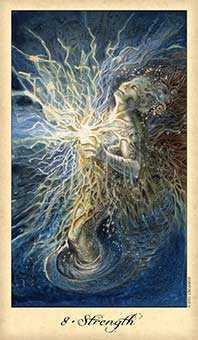 Deliberately identify with your intuition, even if it works against the desires of your willful ego. 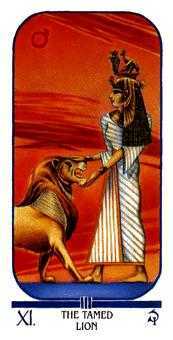 Demand and expect the same from others who have some power in this situation. 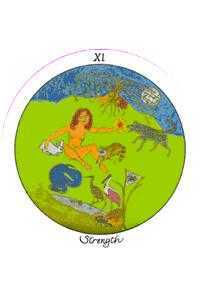 You cannot challenge them to live to a higher standard if you, yourself, have not yet done so. 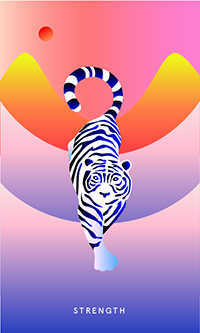 Influence others by setting an example of integrity. 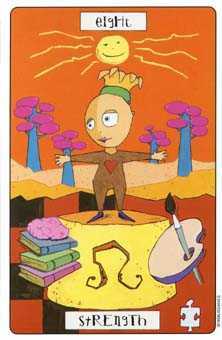 Your self-esteem will increase to the degree that you succeed in your efforts.